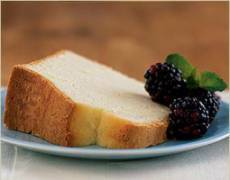 This pound cake is a bit lighter than your usual pound cake. It uses only egg whites and not the yolks. A little less cholestrol for those of you that are watching your fat intake. Preheat oven to 325°F (160°C). Coat a 10-inch tube pan with cooking spray. Beat sugar and butter at medium speed of a mixer until well-blended (about 5 minutes). Gradually add egg whites, beating well. Pour batter into prepared tube pan. Bake in preheated oven at 325°F (160°C) degrees for 1 hour and 35 minutes or until a wooden pick inserted in center comes out clean. Cool in pan 10 minutes; remove from pan. Let cool completely on a wire rack.